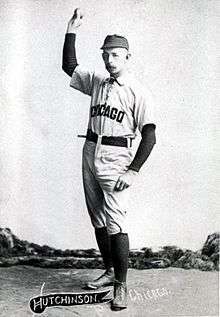 William Forrest "Wild Bill" Hutchinson (December 17, 1859 – March 19, 1926) was an American professional baseball player. He was a right-handed pitcher over parts of nine seasons (1884, 1889–1897) with the Kansas City Cowboys, Chicago White Stockings/Colts and St. Louis Browns. He was the National League wins leader for three straight seasons (1890–1892) and strikeout champion in 1892 with Chicago. For his career, he compiled a 182-163 record in 376 appearances, with a 3.59 earned run average and 1,235 strikeouts. During his seven seasons with the Chicago franchise (now the Chicago Cubs) he ranks 4th all-time in franchise history in wins (181), 6th in games pitched (367), 2nd in innings pitched (3021), 6th in strikeouts (1224), 3rd in games started (339), 1st in complete games (317), 10th in shutouts (21), 1st in base on balls allowed (1109), 1st in losses (158), and 1st in wild pitches (120). ↑ "Bill Hutchinson Statistics and History". baseball-reference.com. Retrieved February 26, 2016.